The leader of Malawi’s Democratic Progressive Party, Peter Mutharika, has been sworn in as the country’s president after the High Court rejected a request for a recount following allegations of vote-rigging. He urged the 11 other presidential candidates to “join me in rebuilding the country”. Outgoing President Joyce Banda had alleged ballot fraud but has now admitted defeat. Malawi is one of the world’s poorest nations. It is heavily dependent on aid, which provides 40% of the government’s budget. A protester died on Friday as police used tear gas and rubber bullets to disperse an angry crowd demanding a recount of last week’s ballot in the south-eastern town of Mangochi. Peter Mutharika is the brother of the late President Bingu wa Mutharika, who died in office in 2012, and had served as his foreign minister. He obtained 36.4% of the vote, according to the electoral commission, and said he felt “very humbled” to become Malawi’s fifth president. “It’s obvious we are facing serious problems in this country. All of us together, let us build the country which is almost on the verge of collapse,” he said. 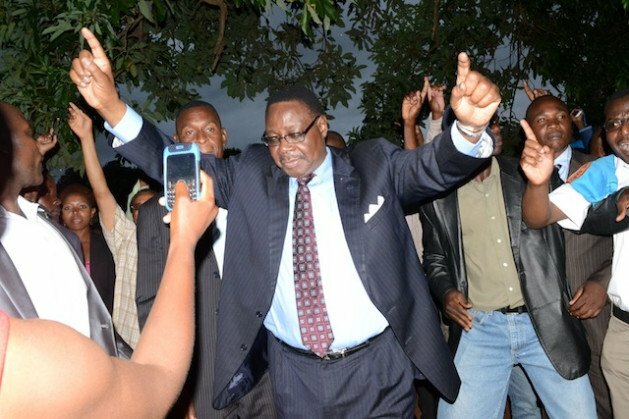 Former preacher Lazarus Chakwera came second in the election with 27.8% of the vote. He represented the Malawi Congress Party, which governed from independence in 1964 until the first multi-party poll in 1994. Joyce Banda, who came to power after the death of Bingu wa Mutharika two years ago, was third with 20.2% of the vote. Her administration had been hit by a corruption scandal dubbed “cashgate”, which led donors to cut aid. She had attempted to have the polls declared “null and void” on the grounds of “serious irregularities”. However, Joyce Banda made no mention of this in a statement congratulating Peter Mutharika on his victory in a “closely contested election” and urging “all Malawians to support the newly elected president… and his government as they take on this foundation of progress and endeavor to develop Malawi even further”.